7 May 2008, at 8:04a.m. Chicken meat production and consumption in Mexico were slightlyhigher in 2007. Chicken meat imports are down due to high international prices, and fewer imports of sausages and other prepared poultry products are expected in 2008. Mexico’s broiler meat production totaled 2,656 thousand metric tons (TMT) in 2007, up 2.47 % from 2006 (2,595 TMT)and is forecastto reach to 2,825 TMT in 2008, an increase of 6.36%over 2007. 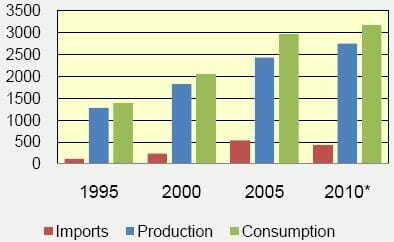 A combination of factors facilitated growth in domestic production. High global feed markets made chicken a popular alternative to other more expensive sources of protein, while strong U.S. exports to countries such as China and Russia resulted in fewer imports from the U.S. The sharp increase in demand for chicken meat combined with decreased imports allowed domestic producers to fill the shortage. Consolidation and greater vertical integration also contributed to the increase in Mexican chicken production. The poultry industry will benefit from the elimination of tariff rate quotas (TRQs) for U.S. corn this year. Feed costs in Mexico represent 55 to 60 percent of the total cost of production. 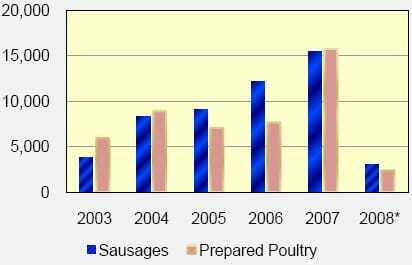 USDA forecast chicken meat consumption to increase by 2.1 percent for MY 2008. Population growth, effective marketing campaigns, increased usage of chicken meat in processed foods and improved product quality are all factors. 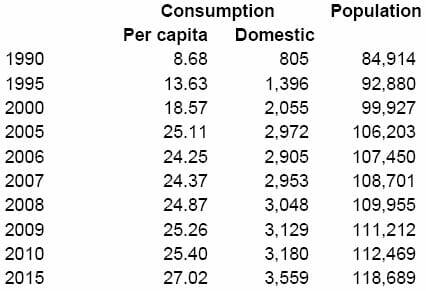 Consumption is also increasing due to the affordability of chicken relative to other meats and increased consumer concerns about cholesterol and other health issues. The U.S. is the main supplier of chickenmeat to Mexico, however Chile's presence in the poultry market is expected to continue to grow. For the period January-October 2007 Mexico imported 5,946 MT of frozen whole turkeys from the U.S. and 1,526 MT of frozen whole turkeys from Chile. For the same period, Mexico imported 41,533 MT of frozen mechanically separated chicken from the U.S. and 2,613 MT from Chile.